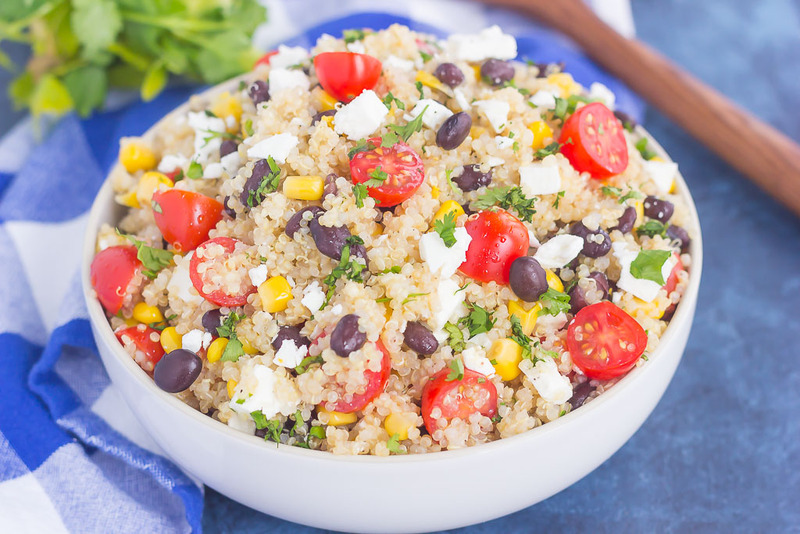 This Corn and Black Bean Quinoa Salad is hearty, on the healthier side, and perfect for a light meal. 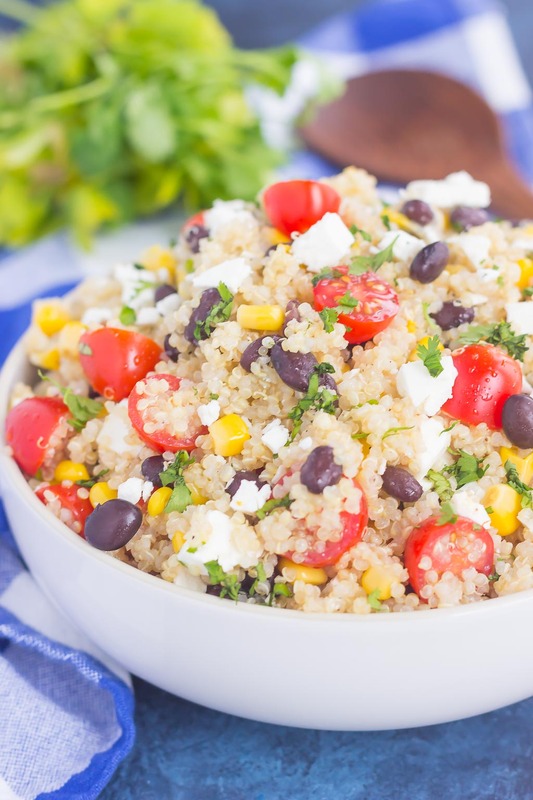 Quinoa is tossed with black beans, fresh corn, cilantro and tomatoes, and then tossed in a light white balsamic dressing. Loaded with flavor and ready in less than 30 minutes, this simple salad is perfect for lunch or dinner! How is June treating you so far, friends? Is the weather everything you hoped it would be? Is your summer filled with lots of fun in the sun? I try not to complain about the weather too much around here, as I know Chicago had a relatively mild winter and little snow this season. But, after having a cold spell in April (70 degree weather, crazy winds, rain, and snow, all in a matter of days), I’m loving the warm weather. I mean, what’s not to love, right? The days are longer, the sun is shining, and we’re in the beginning of the summer. Lots to look forward to if you look at it that way, am I right? But besides the weather, I’m all about the summer food, of course! But, you probably already knew that, seeing as I run a food blog and all. Yes, grilling, fruits and veggies are calling my name, but I especially love salads this time of year. Well, truth be told, I eat them year round, no matter the temperature, but it just seems to taste a little bit better when the temps are warmer. And one of my favorite salad ingredients in quinoa. Now, if you love quinoa, then you probably add it to salads, too. But, if you’re new to this grain, it’s a game changer. It’s a protein-packed grain, rich in lysine, and is a good source of iron, magnesium, and fiber, among other things. It has a slightly nutty taste, but nothing too overpowering. 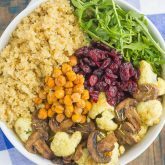 I love to add quinoa to greens, use it in this Raspberry Jam Quinoa Parfait, add it to this Black Bean Taco Quinoa Skillet, and in that Quinoa and Chickpea Pesto Salad. It’s so versatile and perfect in many different recipes. But, since it’s summer, and I’m craving all the salads, I whipped up this Corn and Black Bean Quinoa Salad. 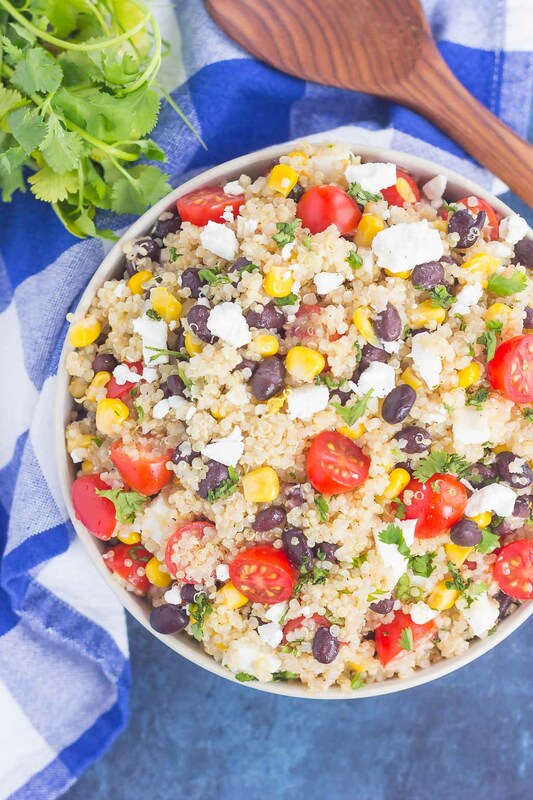 If you love quinoa like I do, then this is the perfect salad for you. The simple ingredients and light dressing give this dish the perfect amount of flavor! And if it’s your first time trying quinoa, I really think you’ll fall in love with the grain. 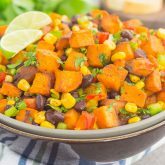 The black beans, corn, cilantro, tomatoes and feta give this dish the right amount of texture and flavor. And that white balsamic dressing is my absolute favorite. In fact, it’s my go-to dressing of choice. You may remember that I used it in this Corn and Tomato Salad and that Corn, Edamame and Chickpea Salad. 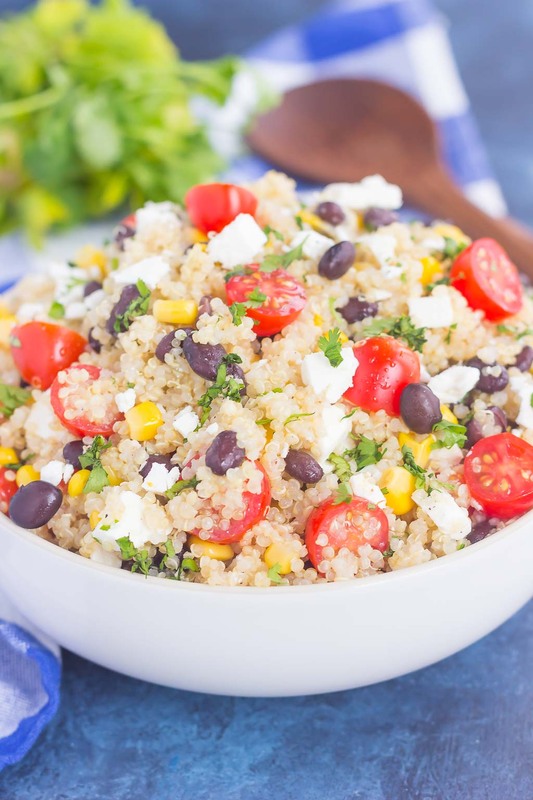 Like most of my recipes, this Corn and Black Bean Quinoa Salad can be prepped and made in no time. And that’s definitely needed come summer, when you want to spend less time in the kitchen and more time outside. Cook the quinoa in low-sodium chicken broth or vegetable broth for a touch of added flavor. Taste the dressing as you go, and add more/less white balsamic vinegar, depending on your preferences. This salad is very versatile, depending on your tastes. 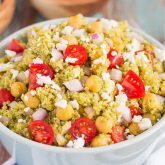 Feel free to swap out the feta for mozzarella pearls; add in red onion or chickpeas; toss in a touch of lime juice; the possibilities are endless! 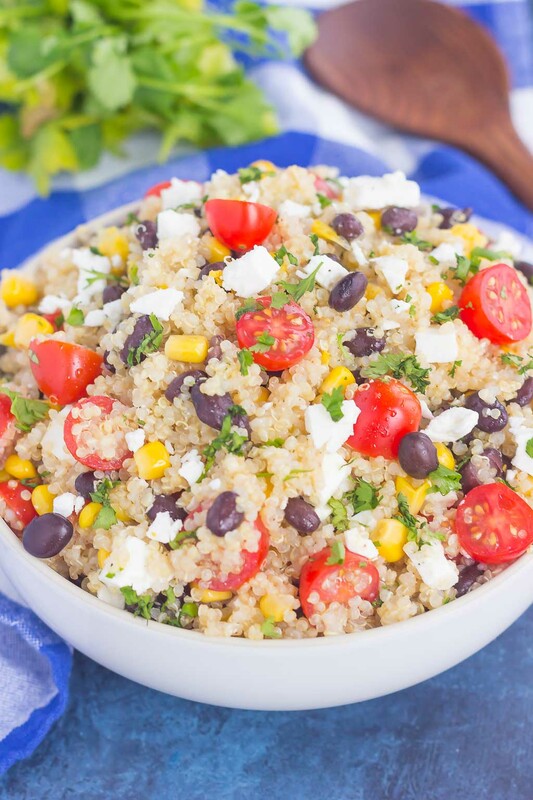 So if you’re looking for a new summer salad, this easy Corn and Black Bean Quinoa Salad was made for you! In a medium pot, cook quinoa according to packaged directions, using chicken broth for liquid, if desired. While quinoa is cooking, prepare the dressing. In a small bowl, combine the olive oil, white balsamic vinegar, garlic powder, salt and pepper. Whisk thoroughly. Taste and add more white balsamic vinegar and/or olive oil, if desired. Once quinoa is cooked, add to a large bowl. Pour dressing over quinoa and toss to coat. Add black beans, corn, tomatoes, and cilantro. Toss to coat. Add crumbled feta and lightly combine. Add more salt and pepper, if needed. I love quinoa, but haven't had it in a very long time! This salad looks so colorful and delicious! Our weather is pretty strange so far this summer. One day it's hot as blazes and the next day it's windy and foggy. I'll take it though because it's better than the school rat race! This quinoa salad is something I could eat every day and not get tired of. 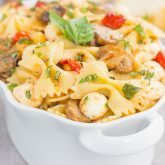 I need to make it for my lunch during the week! Thanks, Marcie! I'm a sucker for a good quinoa salad!